NOTE: There’s been some debate about whether or not Pillsbury Crescent Dinner Rolls are actually vegan. Last time I checked they ARE vegan, not healthy but are vegan nonetheless. 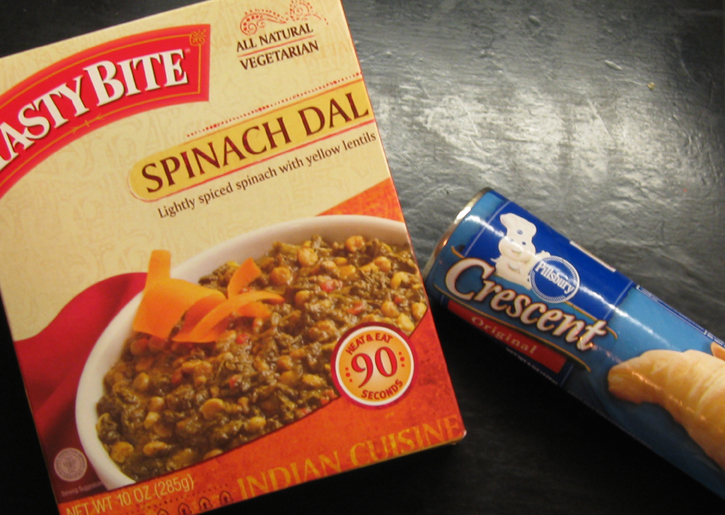 Both are vegan (so long as you’re only buying the Original crescent dinner Rolls). All I’ve done is create what is essentially fingerfood-sized Indian pizzas using these two items. They’re perfect for appetizers and due to their size, can even be packed for lunches throughout the week. Did I mention they are YUMMY!? Pour spinach dal into a bowl so it’s easy to access later. Digging it out of the pouch a spoonful at a time is a pain. Remove dough from crescent tubes but DO NOT UNROLL. Place on cutting board and slice 16 rounds from each tube as if you’re slicing refrigerator cookies. A sharp knife is your friend when cutting dough. I cut the dough in half and kept halving it to get even slices. Place the slices on 2 ungreased cookie sheets, spaced about 2 inches apart. Using your CLEAN knuckles (no bloody knuckles please), press each slice into a rounder shape with an indented center and raised edge. 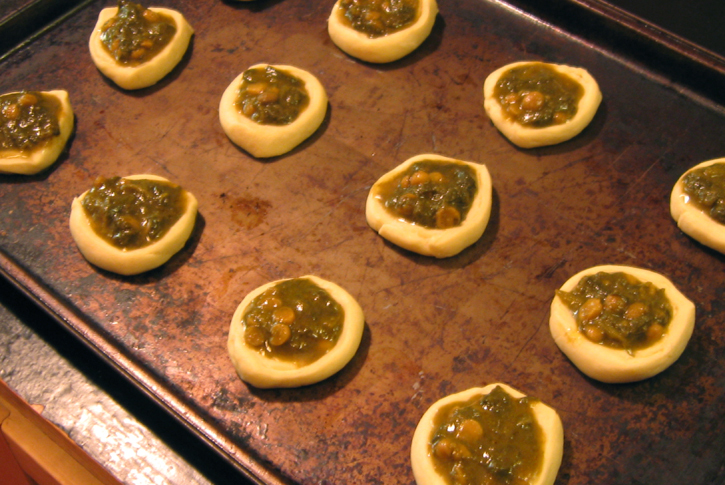 Using a teaspoon, scoop spinach dal into each mini pizza’s indention. There should be plenty of dal for 2 tubes of crescent dough. Bake at 350° F for 15 — 19 minutes. Cool on pan a couple minutes before removing. 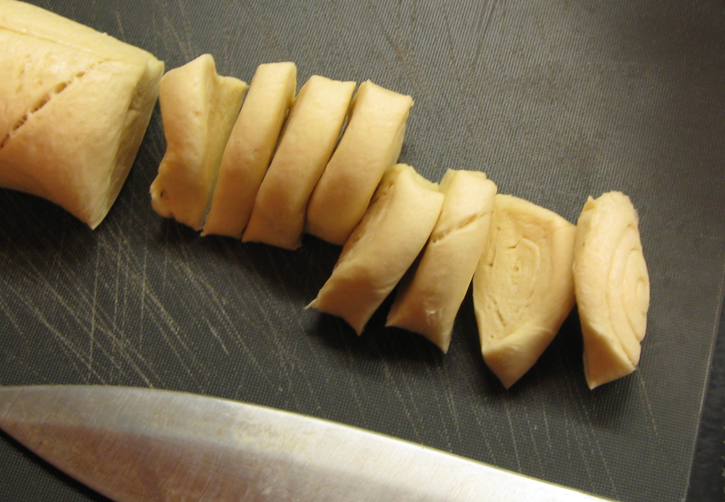 Don’t unroll the dough, just slice it as shown. Put away your brass knuckles and use your real ones to shape mini pizzas. Spoon the spinach dal into each little pizza. You can use any of the premade Indian meal preparations you’d like. I chose the Spinach Dal because I like spinach. You don’t really have to make 2 tubes worth of pizzas but that means you’ll have lots of dal left for something else. These were very hard to not eat all in one sitting. And again, as with most prepared baked goods, there are partially hydrogenated oils in the Pillsbury dough. So don’t eat the whole batch before you go in for a cholesterol check. YUMMAH! They look tasty and cute. WIN WIN! 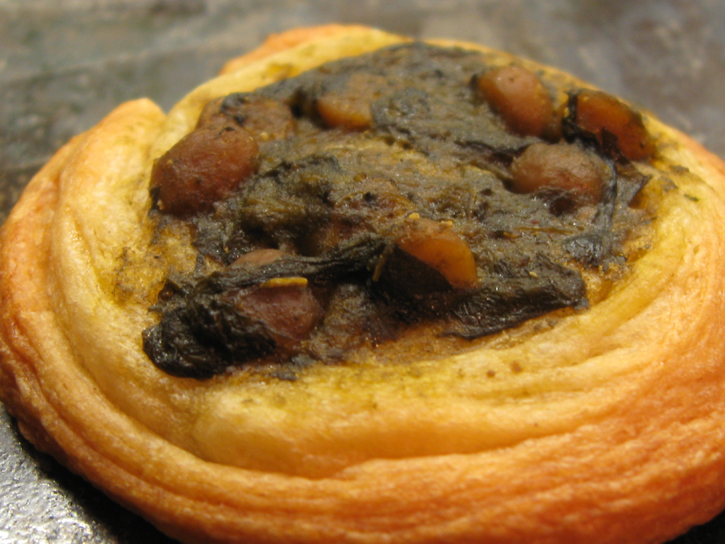 I can’t make these, because JD doesn’t like spinach and I would have to eat them all by my lonesome, but….. BUT! Those little crescent roll rounds look like the perfect basis for a danish. Add a little almond ricotta, cashew creme, or tofu cream cheese, and some preserves or hell, even just some preserves….I think you’d have some perfect, mini danishes. In fact, I think I’ll try it out sometime this MoFo. Wow those look fantastic !! Two of m favourites dal and savoury pastry :) The look quick and easy and would also be great for cocktail parties and any other need for finger food. The Perfect Pizza Press » Blog Archive » Saturday Garbage Plate: The I ♥ Calzones Fan Club!